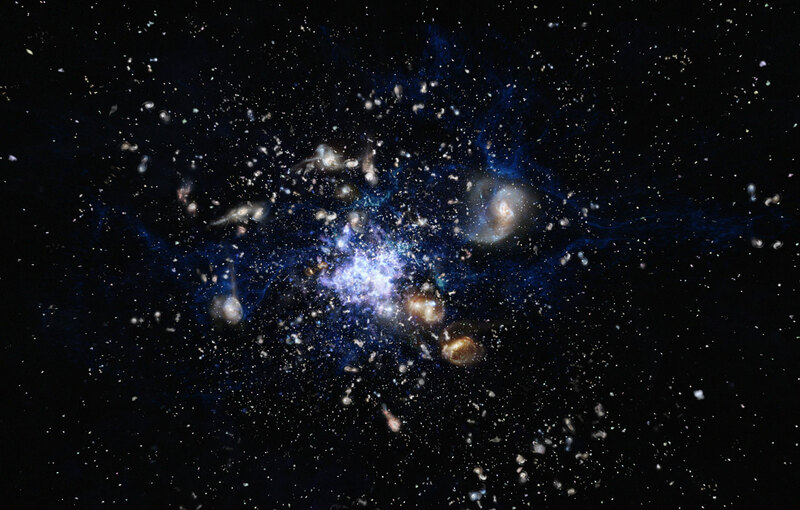 Astronomers have used the APEX telescope to probe a huge galaxy cluster that is forming in the early Universe and revealed that much of the star formation taking place is not only hidden by dust, but also occurring in unexpected places. This is the first time that a full census of the star formation in such an object has been possible. Galaxy clusters are the largest objects in the Universe held together by gravity but their formation is not well understood. The Spiderweb Galaxy (formally known as MRC 1138-262 ) and its surroundings have been studied for twenty years, using ESO and other telescopes , and is thought to be one of the best examples of a protocluster in the process of assembly, more than ten billion years ago. This research was presented in a paper, An excess of dusty starbursts related to the Spiderweb galaxy, by Dannerbauer, Kurk, De Breuck et al., to appear online in the journal Astronomy & Astrophysics on 15 October 2014. APEX is a collaboration between the Max Planck Institute for Radio Astronomy (MPIfR), the Onsala Space Observatory (OSO) and ESO. Operation of APEX at Chajnantor is entrusted to ESO. The team is composed of H. Dannerbauer (University of Vienna, Austria), J. D. Kurk (Max-Planck-Institut für extraterrestrische Physik, Garching, Germany), C. De Breuck (ESO, Garching, Germany), D. Wylezalek (ESO, Garching, Germany), J. S. Santos (INAF–Osservatorio Astrofisico di Arcetri, Florence, Italy), Y. Koyama (National Astronomical Observatory of Japan, Tokyo, Japan [NAOJ]; Institute of Space Astronomical Science, Kanagawa, Japan), N. Seymour (CSIRO Astronomy and Space Science, Epping, Australia), M. Tanaka (NAOJ; Kavli Institute for the Physics and Mathematics of the Universe, The University of Tokyo, Japan), N. Hatch (University of Nottingham, United Kingdom), B. Altieri (Herschel Science Centre, European Space Astronomy Centre, Villanueva de la Cañada, Spain [HSC]), D. Coia (HSC), A. Galametz (INAF–Osservatorio di Roma, Italy), T. Kodama (NAOJ), G. Miley (Leiden Observatory, the Netherlands), H. Röttgering (Leiden Observatory), M. Sanchez-Portal (HSC), I. Valtchanov (HSC), B. Venemans (Max-Planck Institut für Astronomie, Heidelberg, Germany) and B. Ziegler (University of Vienna).